The artists unveiled the mural Thursday at 13th Street and 40th Avenue to honor the late hip-hop star. QUEENSBRIDGE — Artists unveiled a new mural Thursday in tribute to late hip-hop artist Prodigy of the duo Mobb Deep, painted on the side of a building across from the Queensbridge Houses where the iconic rappers spent their youth. Artist Jeff Henriquez painted the portrait of Prodigy with curator and fellow artist Eli Lazare — known as Eli-Eos, who was also behind the mural of rapper Nas nearby — on the side of nonprofit Urban Upbound's building at 13th Street and 40th Avenue. The pair said they started the project "out of love and respect," following Prodigy's death last month at the age of 42. "His deep and meaningful lyrics inspired and influenced many young rappers and followers," the artists said in a statement. Prodigy, whose real name was Albert Johnson, joined forces with fellow rapper Havoc in the 1990s to form the hip-hop duo Mobb Deep. Originally from Long Island and LeFrak City, Prodigy met Queensbridge Houses native Havoc while in high school, and the pair spent much of their time at the sprawling housing complex for which they became best associated, according to XXL Magazine. "Sharing tales of the hardships and socioeconomic conditions of the Queensbridge Housing Projects, Mobb Deep became symbolic to the notorious neighborhood as their dark storytelling and eerie rhymes became a reflection of the everyday struggle in the projects," the magazine noted last week. 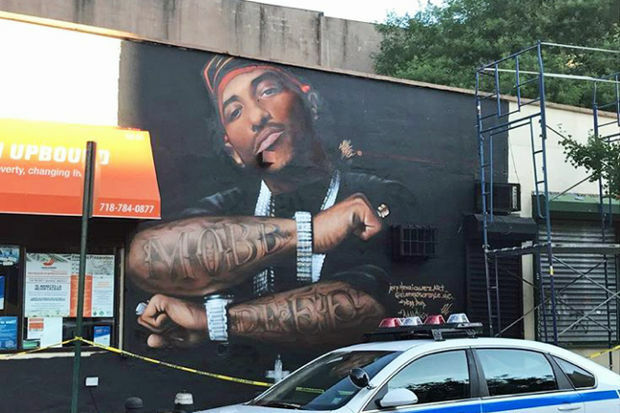 The artists behind the mural are also helping plan a candlelight vigil for Prodigy at the site on July 13, according to a statement.